With a growing number of complaints about a red-tinged screen in some owners with the Samsung Galaxy S8, the company is issuing a software patch allowing users expanded options for correcting the problem in software by placing the responsibility for color accuracy even more in user's hands. A large portion of flagship Samsung Galaxy S8 phones have been demonstrating a visible red tint in screens straight from the factory. The issue is not universal, and was first spotted by early owners in South Korea around April 19. "The reddish tint may be caused by a color balance problem," said an industry watcher to the Korea Herald. "Samsung used deep red AMOLED to strengthen the red." Counterpoint Research analyst Neil Shah told Cnet that he suspects the shift in AMOLED screen construction specifically for the Galaxy S8 family is causing the problem, saying it can "make the usual whites look reddish" and calling it a "software calibration issue." 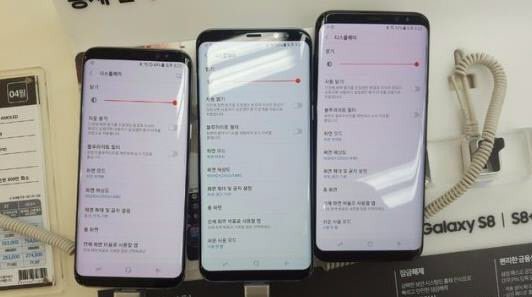 Samsung denies that there is a hardware problem with the phones, despite being presented with multiple examples of out-of-the-box phones demonstrating different tones. Initially it advised customers to manually make display changes. Samsung also advised customers who could not fix the color balance to and "change it at the service center." Users took to social media shortly after the initial declaration to complain that the manual color calibration able to be done did not solve the problem. "In the past, we have received feedback that consumers wanted the ability to customize the color setting of their Galaxy devices due to natural variations in displays, and we provided the option to do so in previous software updates," wrote Samsung in a release about the matter. "While the Galaxy S8 and S8+ have the ability for the user to modify the color of the display, Samsung has listened to feedback and has decided to release a software update as early as next week which will provide customers with a further enhanced ability to adjust the color setting to their preference." The red screen problem appears to be little more than a public relations problem, unlike 2016's Galaxy Note 7 debacle. In late 2016, Samsung denied that there was a hardware problem with the Note 7 "phablet," until multiple cases started piling up, well out of proportion with expected battery failures. Following a soft recall, and poor communications with the US Consumer Protection and Safety Commission, the revised model of the Galaxy Note 7 was similarly bursting into flames —but for a different design flaw ultimately discovered later after deep analysis.